That common siding surface that looks like blocks of solid blocks limestone, granite, or another natural stone is almost never what it appears to be. In most cases, it is a relatively thin veneer of a molded concrete product that has been colored with iron oxides to look like natural stone. The molds impart a texture to the veneer pieces that are very close matches to that of natural stone. When it's properly installed, these veneers are almost indistinguishable from solid stone. There are also synthetic polymer products that try to mimic the look of natural stone, but these exceedingly lightweight products feel more like styrofoam and are not a very convincing duplicates, especially up close. Finally, there is also true stone veneer that is made from thin slices of actual stone—usually limestone or sandstone, but occasionally granite. These veneers can either be quarried and cut into slices, or sometimes smoothed river rocks are thinly sliced with a flat back side to apply against the wall. Veneers made from genuine stone are exceedingly heavy, even though they are only 3/4 to 1 1/2 inch thick. Their weight can come in at about 13 pounds per square foot, about twice what concrete-based synthetic stone veneer weighs. Due to the uniformity of the product, the lighter weight, and the lower cost, manufactured concrete-based veneer accounts for the vast majority of stone veneer installations. True natural stone veneer is found only in the most upper-end homes, while the synthetic forms are a somewhat bargain-basement option. It's important to note that stone veneer of any type—manufactured or natural—is by no means a structural product—it does not bear weight in the way that blocks of solid stone or concrete block can do. Stone veneer is always attached over a framed and sheathed structure like that used when a house is covered with lap siding or stucco. Like stucco, stone veneer requires a base of metal lath and mortar to which the veneer pieces are adhered. Stone veneer comes in several different types, and the exact preparation and installation process will vary somewhat depending on the product. The manufacturer's instructions are the best source of precise directions on preparation, installation, and maintenance. Generally, stone veneer is sold in boxes of flat pieces plus molded corner pieces. Exact preparation steps will depend on the surface to which you'll be attaching the veneer. 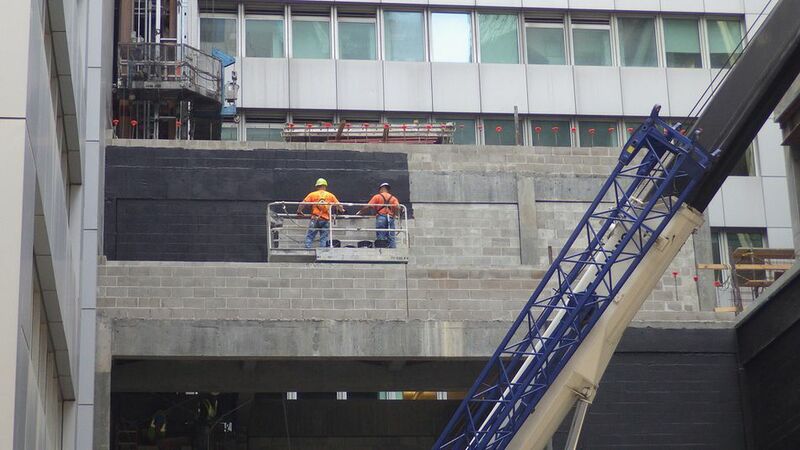 Many products can be applied directly to poured concrete or concrete block walls, but wood-framed walls will require vapor barriers and metal lathe. It is very important to plan the layout of veneer pieces carefully. There are a limited number of patterns in manufacturered stone veneers, and carefully planning the arrangement of pieces helps ensure a natural-looking result. Installation of stone veneers is challenging and it is usually performed by professional teams with lots of experience. It takes a very skilled and intrepid DIYer to tackle such work on a full house project, though veneering a landscape wall or shed can be relatively easy. Here are the basic steps pros use to install manufacturered, concrete-based stone veneers. For wood-framed houses, most veneer products call of installing a vapor barrier against the sheathing as a first step. This can be the same basic house wrap used under lap siding, such as Tyvek. Or, you can use a sheathing paper, such as grade D asphalt builder's paper. On concrete block or poured concrete walls, a vapor barrier may not be required—follow the suggestions of the veneer manufacturer. Next, install sheets of expanded, galvanized metal lathe as foundation for the mortar under the veneer. This lathe is installed using roofing nails driven into studs spaced about 6 inches apart—make sure the nails penetrate the studs. Also anchor the sheating to the sheathing between studs, spacing nails about 6 inches apart. Prepare a scratch coat of type N or type S mortar. Typically, a good mortar mix consists of one part N or S cement and 2.25 parts sand, but premixed scratch-coat mortar is also available. The same mortar used for this scratch coat can also be used for the bond coat and also for grouting the seams. Cover the entire lath surface with the mixture in a layer 1/2 to 3/4 inch thick, using a trowel. Depending on the layout, you might want to add some tint to the coat because it is sometimes visible once the stone veneer is installed. Scrape horizontal grooves into this scratch coat, using a metal scraper or metal comb. The goal is to give the mortar some "tooth" that will help the next layer of mortar adhere. Let the scratch coat dry for at least 24 hours before applying the stone veneer. Start by washing all the stones, then lay out the pieces on a flat surface to test the layout. It's a good idea to blend many boxes of veneer pieces together in order to ensure a random blend of colors and shapes. If you have the space, you can lay out the entire wall section. Otherwise, lay out small sections and apply them in stages. Where trimming is necessary, this can be done with a wet saw, a circular saw equipped with a masonry blade, or a chisel and maul. Remember that trimmed edges will be covered later by using grout, but it is a good idea to position cut edges where they won't be in direct sight lines. As installation begins, it is important to keep the stones damp to prevent them from absorbing moisture from the mortar. Prepare the mortar mix for bonding the veneer. If mixing from scratch, combine 2.25 parts water and 1 part type N or S cement. Mix thoroughly until it reaches the consistency of thick paste. Make sure there is enough water in the mix to achieve a workable consistency, but not so much that the mortar falls off the trowel and drips off the lathe. Using a trowel, "butter" a 1/2-inch-inch thick layer of mortar onto the scratch coat and onto the back of the veneer piece. The texture of the mortar should be paste-like—wet enough so that it will not dry out but stiff enough that the stone can be adjusted and leveled as you apply it. Work in small areas of wall, so that the mortar does not dry out before you can cover it with veneer. The best strategy is to begin at wall corners near the bottom, working up and outward. Begin by installing the veneer pieces that wrap around corners. Begin at the bottom and work upward. Press the stone firmly into the mortar and hold it in place for about 10 seconds. Rotate the stone gently while pressing inward to squeeze the mortar out. You should see some mortar bunch up around the edges of the stone. If the stone slides or slips when you release it, then it's likely the mortar layer is too thin or that the mortar has been mixed too wet. After the corner pieces are installed, work outward with flat pieces, again beginning at the bottom and working upward. Edges trimmed by saw should be carefully placed in areas where they aren't obvious. For best results, keep the joints narrow and consistent in width. Narrow joints generally give a more professional look. If mortar gets onto the face of the veneer pieces during installation, wait just long enough for it to harden slightly and get crumbly, then brush it away. Don't allow it to harden overnight. Stone veneer joints should now be filled with a grout mix—which can be the same mortar mix used for the scratch coat and bonding mortar. A grout bag—a canvas bag with a metal nozzle on one side—is the tool of choice for this work. Fill the bag with mortar and squeeze it while moving the nozzle along the joint. Also make sure all trimmed edges and ends are covered with mortar. Joint depth should be uniform—the grout can be recessed slightly or can fully fill the joints, but make sure to keep the depth consistent. When the mortar mix starts to dry, use a pointing tool to pack the mortar into the joints, eliminating any voids. Use a mixture of vinegar and water and a steel wire brush to brush away any excess dirt or mortar residue on the face of the veneer. It is important to clean stone veneer within 30 minutes, before mortar can fully dry on the face. Seal the veneer stone following the manufacturer’s instructions. Re-seal the veneer every other year or following the manufacturers recommendations. Sealed stone may be easier to clean than unsealed stone, and certain sealers also repel stains.